People have been asking about the fat in nuts. What about nuts? Can I eat them? Will they cause insulin resistance? Will they make me gain weight? 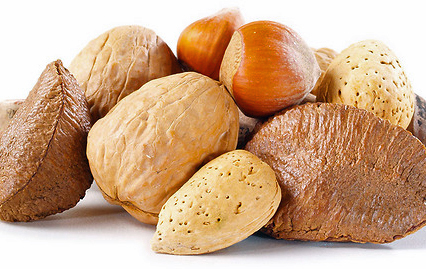 We don’t absorb as much fat in nuts because chewing doesn’t liberate it. The fat in nuts is fresher, not oxidized, or not as oxidized as fats that have been mechanically or chemically extracted, heated, exposed to bleaches, preservatives, and other chemicals, exposed to air/oxygen, and stored. Any storage increase oxidation. Oxidized fats lead to inflammation, and inflammation is at the heart of many diseases (diabetes, heart disease, cancer, arthritis). Nuts come packaged with benefits … nutrients and phytochemicals that act as antioxidants, things that processed oils lack, things that can stem problems associated with oxidation of their fat. This entry was posted in Uncategorized on February 6, 2015 by Bix. Given that peanuts aren’t technically a nut, do they still fall squarely in this category? Yes, all three of these points apply to peanuts, especially if the red skins are still on (lots of antioxidants in those skins). We don’t absorb as much fat from whole peanuts as we do from peanut butter.